I miss lots of things about living in Washington. I miss all of the the green, the lakes, the city and tons of the restaurants. One of the restaurants well, fast-food establishments that I miss is Jack in the Box. Oh, how I crave their Oreo milkshakes! One of my favorite meals is their 2 for 99 cents tacos. Whenever I travel to a state where a Jack in the Box is located I make sure to eat there at least twice. 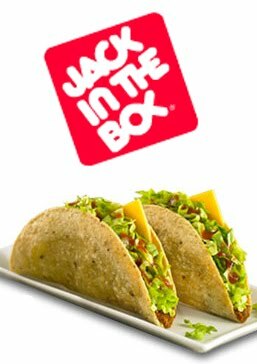 Well imagine the joy I felt when a friend told me that Burger King sells tacos very similar to Jack in the Box!!! They aren't quite the same but they are delicious and they will definitely hold me over until I can get the real thing. They are a little more pricey costing $1.29 for two but the extra 30 cents is well worth it - the grease stains on my shirt are proof. Oh, man -- I love Jack in the Box, too! There's one in North Carolina. I wanted to stop there on my way to Chapel Hill last weekend, but Brooks and Jacki wanted Chik-fil-A instead. I should have just driven over there, anyway. It crushes Chik-fil-A. Sigh . . .
HaHa This totally brings back memories of us escaping high school to get these at our lunch break!!! Yummy! Mmmm....sounds like we need to stop by burger king on Tuesday. Oh those were happy fast food memories to good ole Jack in the Box! I will have to try Burger King's tacos out! I say we all meet in WA for tacos and milkshakes! There really were some good food places there...Rooters, Cucina Cucina, Taco Del Mar, and Kami Teriaki, to name a few.